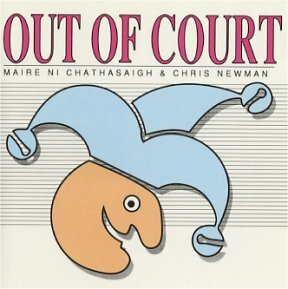 In late 1991, Máire and Chris released Out of Court, an effervescent mixture of baroque-influenced Carolan, straight-down-the-line Irish dance music, haunting songs and a 17th century air from the ancient Irish harp tradition, interspersed with original compositions which exhibit some dazzling jazz-influenced pyrotechnics. They're joined by a stunning selection of star guests: legendary uilleann piper Liam O'Flynn; Máire's gifted fiddle-playing sisters Nollaig, who has been a member of bands as diverse as Planxty and the RTE Symphony Orchestra (!) and whose virtuosity, versatility and lyricism are displayed throughout the album, and Mairéad, whose distinctive, subtle and very traditional style is featured on one track, Frieze Britches; bass player Danny Thompson, renowned in jazz and other music circles and known to folk music fans since his early days with Pentangle; and mandolin maestro Simon Mayor. "Displays a stunning array of techniques and moods and some supreme musicianship in performance and arrangement. The scintillating jazz-influenced title track opens the album in fine fettle... Nollaig, Liam and Danny provide impeccable backing for one of the most haunting tracks Will You Meet Me Tonight on the Shore? But it's Máire and Chris's own expertise on their particular instruments together, ensemble, and solo that are rightfully allowed to dominate the feel of the record. Máire's exquisite solo rendition of the air The Wild Geese and Chris's solo performance of a self-composed jig and a Scott Skinner reel blend in smoothly amongst the ensemble tracks to complete one of the most refreshingly innovative releases in recent years." Daily Telegraph "Gloriously adventurous offering from Máire Ní Chathasaigh, a scholarly Irish harpist, in truly inspired union with Chris Newman, a quirky English master of the acoustic guitar... (It is) of course a showcase for their startling virtuosity; but it adds variety through songs; gloriously adventurous and jazzy sounds from Newman's 1930 Martin guitar; and sterling assistance from Danny Thompson and Simon Mayor among distinguished session musicians." Taplas "Certainly, I'll settle for this Out of Court. What more could I say if I contested it? It's an album of sheer delight. Máire Ní Chathasaigh's mission is to prove that the harp is far more versatile than commonly believed. She isn't alone, but few can rival her ability to play so many different styles with equal facility. Just as accomplished, Chris's nimble fingers always make sparks fly and together they're a formidable partnership. With others, they really make this party swing - appropriately, as the title track and Stroll On!, both originals, could be straight from the swing era. The former features a superb fiddle solo from Nollaig Casey and a scintillating burst from Simon Mayor's mandolin. Other guests are uilleann piper Liam O'Flynn, Mairéad Casey on fiddle and double bass expert Danny Thompson. Various styles are sandwiched in between. Particularly impressive dance-tunes are Máire's self-penned slip-jigs The Harper's Chair/The Cherry Blossom and A Sore Point, played by the Chris Newman Trio (i.e., Chris on guitar, mandolin and bass). Máire contributes three songs, including the beautiful Will You Meet me Tonight on the Shore? and The Lakes of Coolfin. Carolan is represented by the elegant Lady Gethin, whose baroquishness contrasts starkly with the majesty of the older The Wild Geese, played as a harp solo. An excellent mix of frivolous and more heavyweight material."